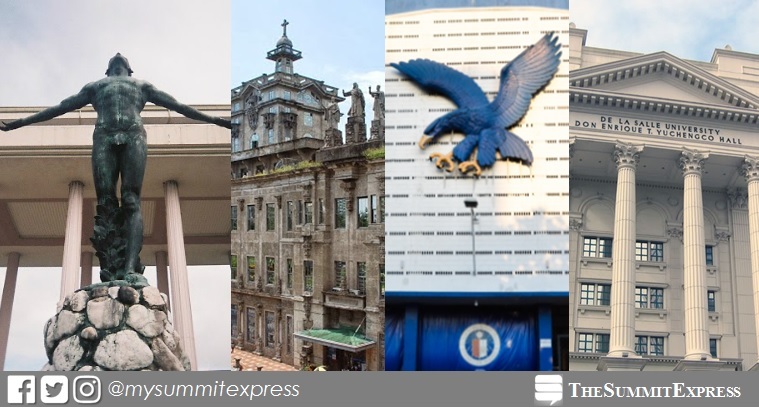 MANILA, Philippines - For three consecutive years, University of the Philippines - Diliman (UPD) dominated the list of most popular colleges and universities in the Philippines. This is based on the 2018 web ranking or online popularity as released on Tuesday, January 23 by UniRank (formerly 4 International Colleges & Universities or 4icu.org), an international higher education search engine and directory reviewing accredited institutions in the world. "University of the Philippines Diliman (UPD) is a large (uniRank enrollment range: 20,000-24,999 students) coeducational higher education institution. It has a selective admission policy based on entrance examinations," Unirank said on their website. University of Santo Tomas (UST) overtakes Ateneo de Manila University (ADMU) to claim the second spot with the latter now on third place. Completing the top 10 are Polytechnic University of the Philippines (PUP), University of the Philippines (UP) - Manila, University of the Philippines Los Baños (UPLB), Mapua Institute of Technology (MIT) and University of San Carlos (USC). In Asia, Fudan University reclaimed the highest place in the list of 200 universities. The University of Tokyo, previous year's no. 1, came on second place. Meanwhile, Massachusetts Institute of Technology, Harvard University and Stanford University in the United States dominated this year's global ranking. According to their website, the uniRank University Ranking aim is to provide a non-academic League Table of Universities based on unbiased and valid web metrics: Moz Domain Authority, Alexa Global Rank, SimilarWeb Global Rank, Majestic Referring Domains and Majestic Trust Flow.